Join your fellow CBA Alberta members by participating in Sections by lending your expertise and network with like-minded professionals. Visit our job board to see openings from leading organizations and firms from across Canada. With postings from small and solo practitioners, to some of the largest employers of legal professionals, your next position is waiting here for you. 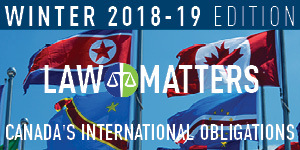 In our winter issue, we look at Canada's international obligations, including topics such as the agreement formerly known as NAFTA, implementing UNDRIP, and young Canadian lawyers for universal human rights.